I was feeding sheets of paper into a paper shredder and stopped suddenly when I felt a piece that seemed to be damp. The other sheets of paper in the same pile were dry, so how is it that this one sheet appeared to have picked up moisture? As far as I could see, this “damp” sheet came from the same place as the others, which was a stack of various documents, flyers from the post and envelopes with their plastic windows torn out. Curious is it not, to have just the one damp sheet in a pile, how can this be? When I say “damp”, the feel of the sheet of paper was not obviously moist but had an unusual coolness. I’m not explaining this well, but it’s difficult to find the words to communicate how the feel of the paper was different. Take it from me, there was something strange about this sheet of paper, and it “felt” like it had something to do with moisture. Researching into this, I found that there’s plenty of information out there in the big wide world about paper and moisture. Even better, this information contains details of why and how paper interacts with moisture. By applying this information I think I now have a good explanation of my unusual sheet of “damp” paper. To fully grasp how paper interacts with moisture you need to first know how paper is made. It wasn’t until I started this paragraph that a vague memory from my school days popped up. We had a school trip to a paper mill just outside Edinburgh. I’ve actually seen paper being made. These days of course there’s YouTube! Wood from trees is debarked then chopped into small chips. In a large pressure cooker the wood chips are turned into wood pulp by mechanical blending in water and other chemicals. This separates the cellulose wood fibres and the type and extent of mechanical action results in fibres of different sizes. As you can see in the inserted paper making image, the pulp goes onto a paper making machine. This is the one part of the process that I remember from the school trip. A watery slush of the pulp is sprayed onto a moving screen and enters a series of rollers. Very soon after the first set of rollers, out pops a large sheet of something that looks like paper, only a few seconds after it being a liquid. It must have been this transformation that amazed me and stuck as an image in my memory. During the rolling process the cellulose fibres align themselves to form paper. How the fibres line up depends on the source of the pulp, such as the type of wood, and other materials added, like re-cycled paper. Also, the mechanical and chemical treatments affect the type of paper being made. Now we are getting to crux of my “damp” paper finding. 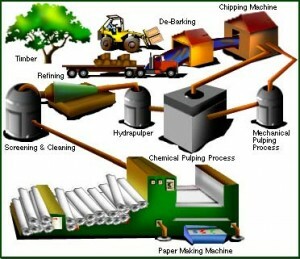 Paper manufacturers carefully control their paper at the various stages of production using computerised technology. By optimising their processes they attempt to produce paper that has low moisture adsorption in the ambient range of humidity. This means that so long as the surrounding humidity does not get too high, the paper will not pick up moisture to a level that affects its quality. To understand why it is important for paper manufacturers to optimise their production processes in this way, we need to know two things. First, the cellulose wood fibres under pressure in the rollers do not align randomly; cellulose is a polymer, a long chain of sugar molecules attached end-to-end; as water is removed from the slushy pulp under pressure of the rollers, the polymer chains of cellulose form a structure that gives paper its tensile strength. Second thing you need to know is paper, just like wood, comes to equilibrium with moisture in the air. Small electrical charges from the sugar units in the cellulose polymer chain attracts opposite charges on water molecules. At a particular point, that is not possible to calculate but can be measured, an equilibrium is set up. Many factors influence the actual equilibrium point, but the key to this happening is the relative humidity of the surrounding air. In fact, this effect of moisture is called the Equilibrium Relative Humidity which I describe in Chapter 3 of my eBook “A Wet Look At Climate Change”. A simple truth, and one that is easy to remember, is that any material sitting in a humidity above its equilibrium point will always adsorb moisture from the air. When this happens with paper, the water molecules get in between the cellulose polymer chains and push them apart. Due to these polymers being arranged in a structure that is not random, the effect of water pushing them apart changes the structure differently in different directions. This is why when paper has been exposed to dampness it wrinkles and warps and it is almost impossible to flatten and get it back looking how it started. The fibres made up of the cellulose polymer chains do not naturally come back to the same orientation as when the paper was made. Bringing you back all the way to where I started with my “damp” sheet of paper, I now have an explanation. For whatever reason, when that sheet of paper was made, it had an equilibrium point that allowed moisture uptake close to normal ambient conditions. Even though this sheet of paper was in a pile of paper, the equilibrium point would mean that it “preferentially” adsorb moisture over the other sheets of paper. Mystery solved! This entry was posted in My Moisture Technical and tagged Damp Paper, equlibrium humidity, ERH, Moisture, Paper Making on April 10, 2016 by PeterMoir.